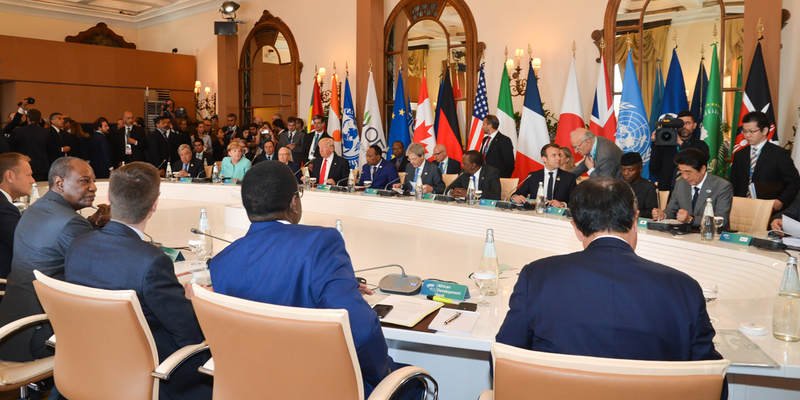 The second day of the G7 in Taormina kicked off at 8.30 with a welcome ceremony for political leaders and representatives of international organizations that today have joined the Heads of State and Government of the G7 countries. African leaders include the President of Niger Mahamandou Issoufou, Kenya's President Uhura Kenyatta, Tunisia’s President Beji Caid Essebsi, Nigeria's Deputy Prime Minister Yemi Osinbajo and Ethiopia’s Prime Minister Haile Mariam Desalegn. Representatives of African organizations who are involved in today’s sessions are African Union Chairperson Alpha Condé, African Union Commission Chairperson Mahamat Moussa Faki, and President of African Bank for Development Akinwumi Adesina. UN Secretary General Antonio Guterres, OECD Secretary General Angel Gurría, International Monetary Fund Managing Director Christine Lagarde, and World Bank President Jim Yong Kim are attending the Summit as well. Working sessions are now ongoing and will end in the early afternoon. The Italian Presidency press conference is scheduled at 15.00, followed by press conferences of individual G7 countries.